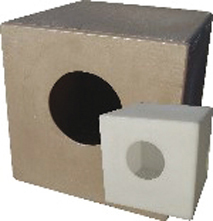 Cocoon is the latest environmental enrichment bedding product for rodents. Cocoon offers the animal an opportunity to fulfill their nesting instincts. Cocoon's small light weight cylindrical form makes it possible for the animals to move it around their environment which increases the interaction between the animal and the enrichment product. The fibers of the Cocoon product are very short which is safer for the animal and allows it to create a vaporous cloud, with which it builds its nest much like in its natural habitat. Cocoon is whitened without chlorine. Sold 6,000 cylinders per case. 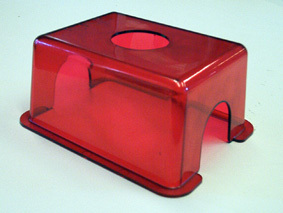 Autoclavable, red polycarbonate square mouse house. This transparent Igloo also allows mice to control their microenvironment. 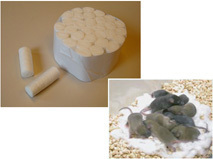 Mouse igloos have proven to be beneficial not only in helping prevent boredom and aggressive behaviors but to aid in breeding. Igloos were developed for the risk-free use and safety of laboratory mice. The activity wheel is sold seperately. 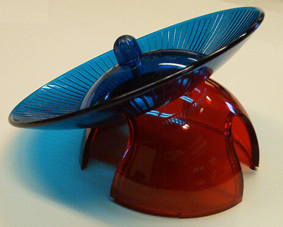 Both the Igloo and the Wheel are made of autoclavable polycarbonate. All plastic home for small animals. The Abode has a perforated bottom and has holes in the back for hanging. Available in brown, green, red and translucent. Designed specifically for rats. Offers a great place to hide and rest. Made from tinted polycarbonate for an extra sense of security. These toys are made from durable plastic and come in three colours. This shelter can be used for a variety of small animals. 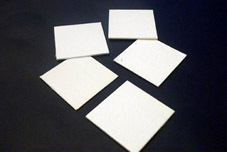 It is made from tough polyethylene.